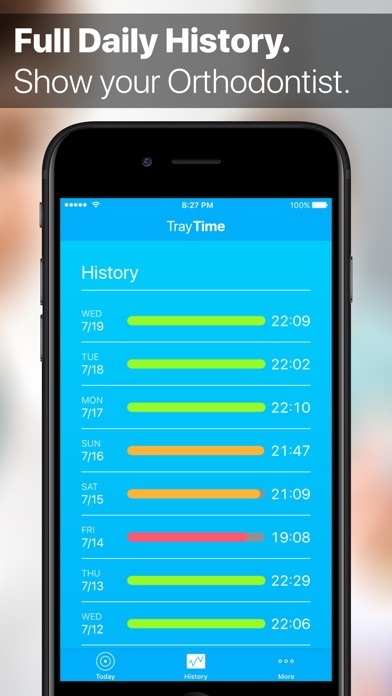 TrayTime was designed by an Invisalign user, for Invisalign users. 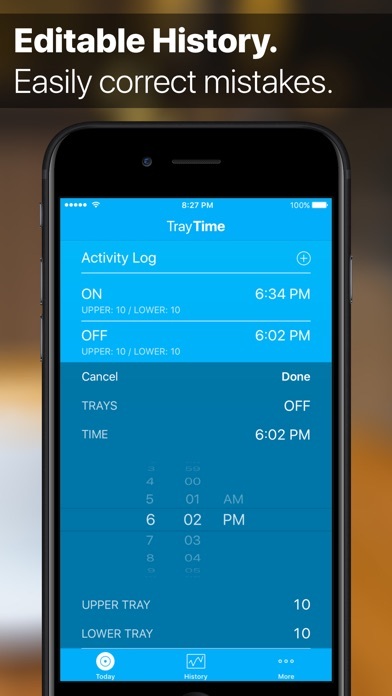 Refined over months of real-world usage, TrayTime makes using the app as streamlined and simple as possible. Start and stop the timer with a single tap. Easily view how long your trays have been on for—and off for! This makes it really easy to tell if you're on track to hit your daily goal. When you inevitably forget to start or stop the timer, TrayTime makes it simple to fix. You can easily add or edit past events. TrayTime tracks your full history, so you can visually monitor your usage trends, see which days you achieved your daily goal, and identify any areas for improvement. Show your history to your Orthodontist to put a smile on their face. 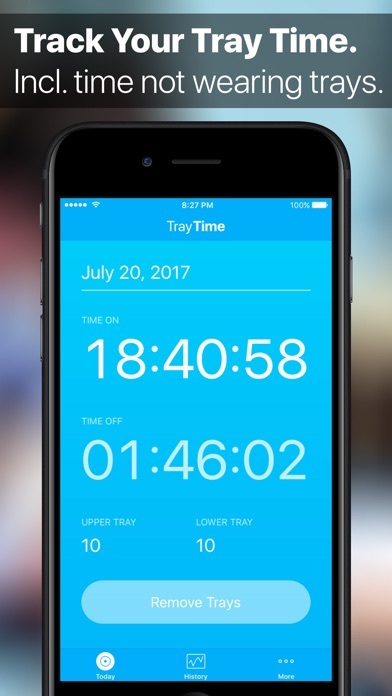 TrayTime includes a streamlined Apple Watch app. 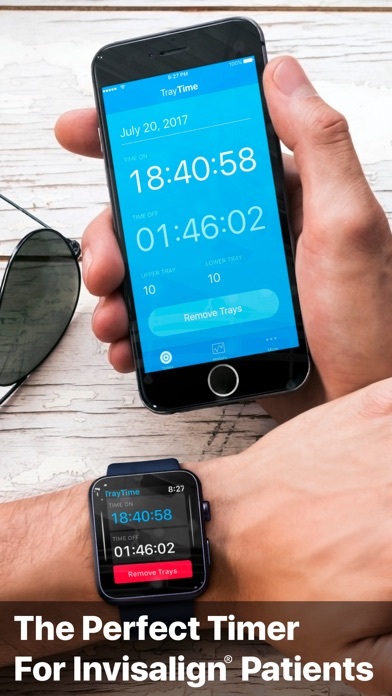 Start and stop the timer directly from your wrist, and quickly check your daily usage. The included complication displays the timer state on your watch face, and allows fast access to the app. Designed specifically for the daily needs of Invisalign users, TrayTime makes it simple to record your tray usage and stay on track to achieve your perfect smile. APP FEATURES * Streamlined interface designed by an Invisalign user, for Invisalign users. * Large display shows your "Time On" and "Time Off". 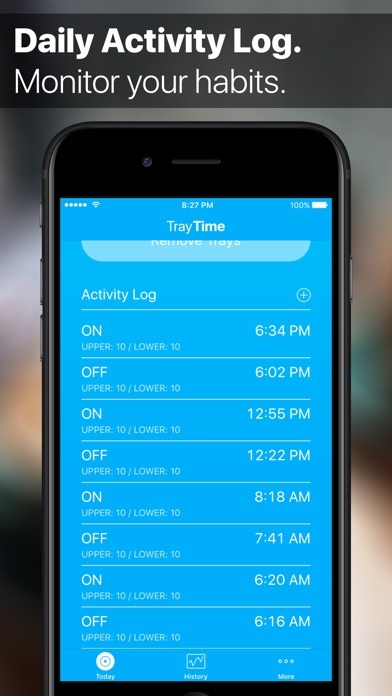 "Time Off" shows you how long your trays have been OFF for today, so you can quickly calculate if you're on track to hit your daily goal (or whether you have time for a snack). * Start/stop the timer with a single tap, or from the Apple Watch app, or from the iPhone's Quick Action shortcut menu. (Requires iPhone 6s or higher) * Records a full history of every event. History is easily editable if you forgot to start or stop the timer. * Visual history indicates which days you met your daily goal in a clear, easy-to-read format. * Configurable daily goal. Set to 22 hours per day by default, but configurable for your individual needs. * Manually add timer events if you removed your trays when your iPhone was out of reach. * Track which tray number you are currently on. APPLE WATCH FEATURES * Quickly view your "Time On" and "Time Off" directly on your wrist. * Easily start and stop the timer in the Apple Watch app. * Provides a watch face complication so you can quickly see if the timer is running, and rapidly launch the app. * App works even when your iPhone is out of range. Any timer events started/stopped will be synced back to your iPhone. IN-APP PURCHASE * Some features require a one-time in-app purchase. * A 7-day trial is available in the app, so you can try before you buy. * A single, one-time purchase unlocks the app on all your devices. As a new Invisalign user, I wanted something more sophisticated than just using a stopwatch, and easier than a spreadsheet. I had thought about creating my own IOS app if one didn’t already exist, but this app has so far fit all my needs and use cases after 7 days of trying it out. And having that 7 day free trial really sealed the deal, I just paid to unlock it permanently this morning. I like the interface design and UX of it, I like (and need, apparently) the ability to edit the days in/out times, and I like the built in historical tracking. It’s easy to use, and looks pretty good while doing its job. Thanks for making a great app! This app could have so many additional features - reminders to put trays back in, reminders when they’ve already been out too long, reminders and messages for how much you’ve improved or are heading in the wrong direction. Tracking my time would be a nightmare without this app. It is so simple to use. More importantly, it keeps me honest as to exactly how many hours a day I wear the trays. I especially love that it works with the Apple Watch. It sure is making my life easier during my Invisalign treatment. I love this app!!! It really helping me keep track of my Time off and on with my trays. You can edit your time if you forget to use it as well. So helpful and I recommend this. So far I am doing 22hrs as recommended, but I do relax here and there when I need to eat more. I use it every day since about 3 weeks. Two things I would love to see. Some kind of indicator for the iPhone app (maybe an app icon badge that shows the off minutes, or at least a 1 when the tray is off). Plus a reminder every 15 minutes or so when the tray is off.